Bird Guiding Business (year-round) Hiking, camping, caneoing, skiing, snowshoeing, and carbirding trips. Many Presentations on avian topics. WASHINGTON, D.C. – National Nuclear Security Administration (NNSA) Administrator Thomas D’Agostino today welcomed Anne M. Harrington as the new NNSA Deputy Administrator for Defense Nuclear Nonproliferation. Ms. Harrington will manage NNSA’s $2.7 billion nuclear nonproliferation program, in more than 100 countries to secure vulnerable nuclear material around the world, stop nuclear smuggling, and prevent the proliferation of weapons of mass destruction. Ms. Harrington most recently served as Director of the U.S. National Academy of Sciences Committee on International Security and Arms Control from 2005 to 2010. Prior to her service at the National Academy, Ms. Harrington served at the U.S. Department of State as an expert on nonproliferation and cooperative threat reduction, and was responsible for developing policy and implementing programs aimed at preventing the proliferation of weapons of mass destruction and missile expertise in Russia and Eurasia. Ms. Harrington graduated with a bachelor’s of arts degree from St. Lawrence University, an M.A. from the University of Michigan, and an M.S. from the National Defense University National War College. She has two children, Meredith and Owen Lynch. Heated Garage or Barn Space Available for Snowmobiles! Stop Packing! Stop Trailering! Save Gas! Leave your gear and sleds right here! Arrive and Leave Whenever You Want All Winter!! Here is one of the candidates running for governor. And if you’d like to read more about the upcoming election or watch a wrap up on the debate and for a link to the 90 minute debate check this out from NY1. The information in this post is not a reflection of any political opinion. No candidates are endorsed on this website. It is here for entertainment and education only. 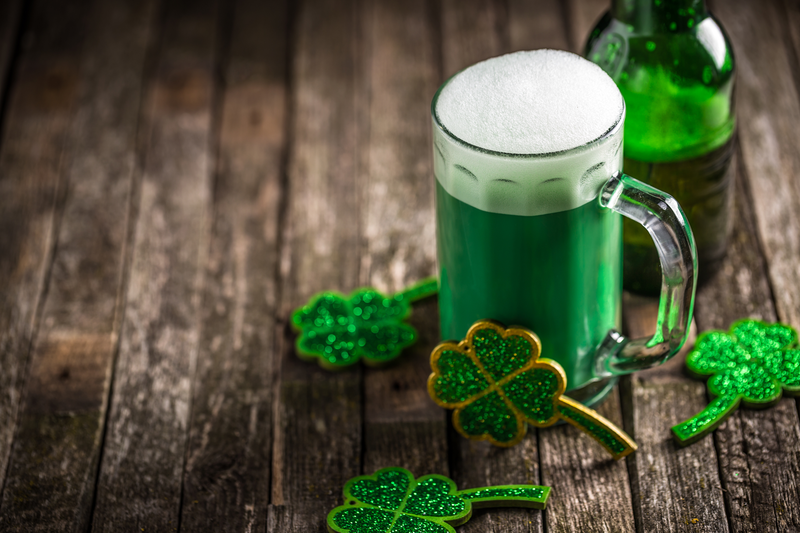 You’ll have to cut and paste this link because I don’t have time to properly link it. 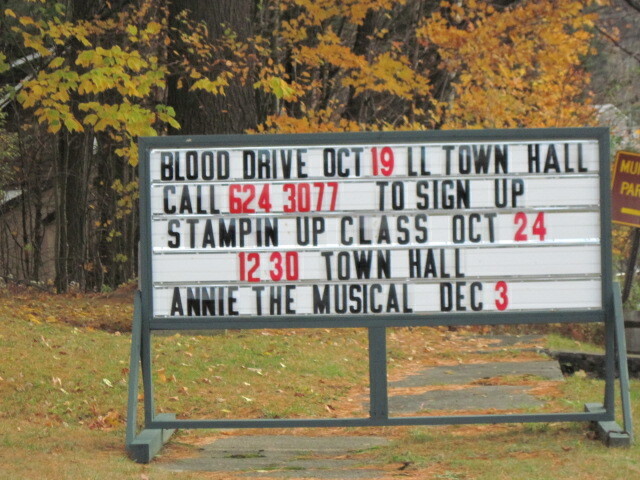 On October 19, 2010 the Long Lake Town Hall on Route 30 in Long Lake, NY was the site of the Red Cross Blood Drive sponsored by the Town of Long Lake and Long Lake Central School. Twenty seven were pre-registered, twelve walked in and forty-four donations were made. Students from Long Lake Central School including Jessica Pitcher, Eve Tobey and Melissa Clark volunteered their time after school at the Long Lake Town Office to rustle up donors. A partnership between the town and school has become an important component to the success of student community service and Melissa, Eve and Jessica were a huge asset. Patty Farrell entertained donors at the snack table, Anna Pratt registered all appointments, Cindy Black commanded the coffee and seven nurses were on hand counseling. Many generous Long Laker’s baked cookies and made treats for the donors. The goal was for forty pints and eight DRC donations. What is a DRC? A double Red Cell Donor. Whole blood donations contain red blood cells, platelets, plasma and white blood cells. Red blood cells are the most frequently used blood component and are needed by almost every type of patient requiring transfusion. If you meet certain criteria, double red cell donation allows you to safely donate two units of red cells during one appointment as an automated donation process. It is as safe as whole blood donation. Double red cell donation take about thirty minutes longer than a whole blood donation and you could donate approximately every four months. 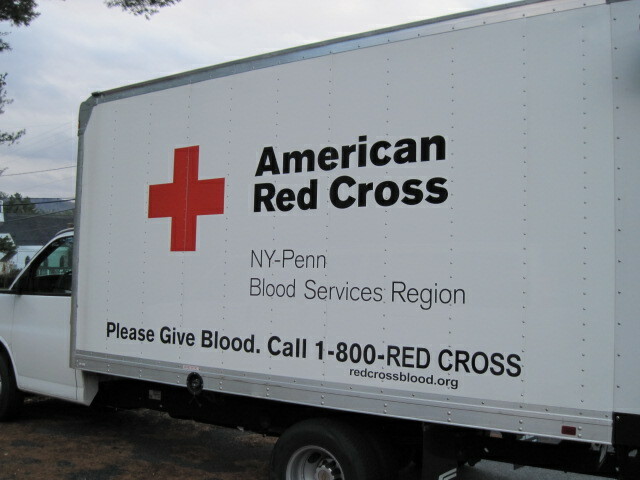 The next Red Cross Blood Drive will be at Long Lake Central School on January 21st, 2011. The Spring collection will be on April 28th, 2011 at the Long Lake Town Hall. Our goal is to exceed our double red blood cell donations. 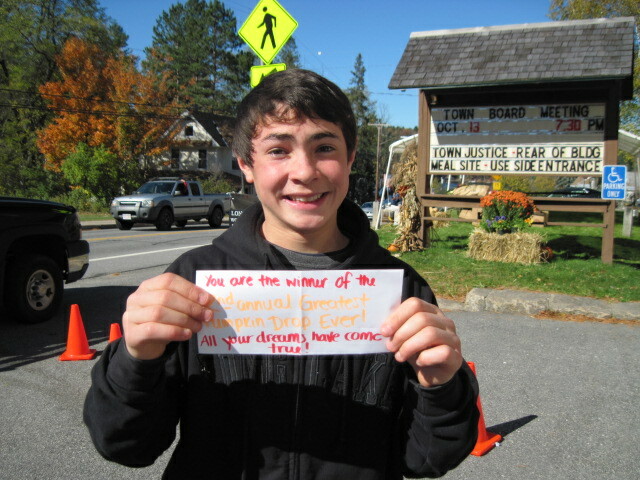 Long Lake hosted Harvest Fest on October 9th featuring the long anticipated pumpkin drop. Judges, Natalie Luxford, Trudi Winter and Valerie Galvangi compared seventeen entries. Stephen Lamos of Long Lake took home the coveted cash prize for Best Splatter. 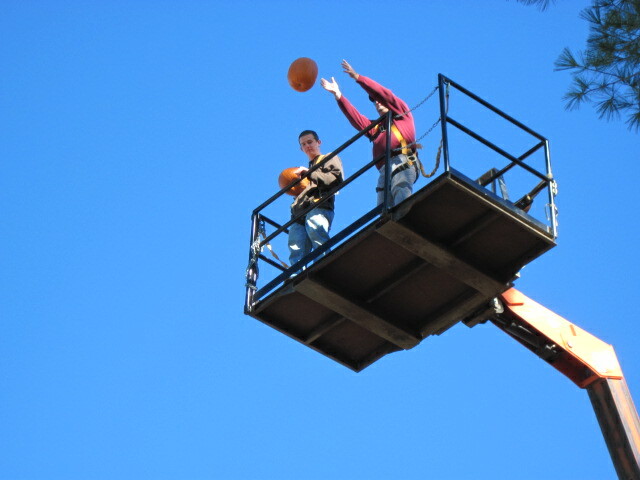 Highway Superintendent, Chip Farr, and Canton college student, Erik Arsenault, were launched over 42 feet in the air to drop the pumpkins behind the Long Lake Town Hall on Route 30. 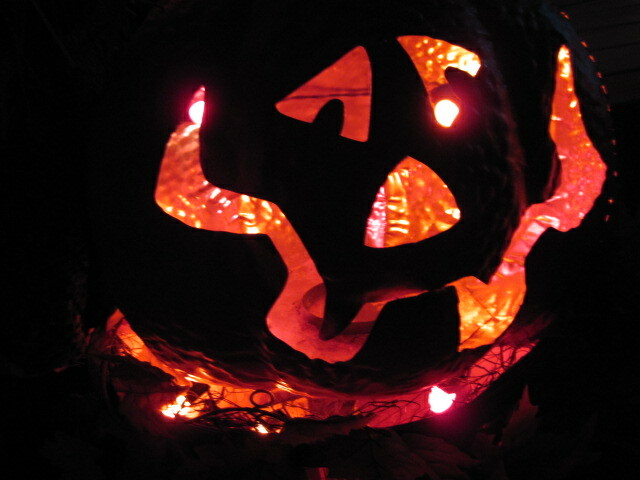 Halloween has arrived early in Long Lake. 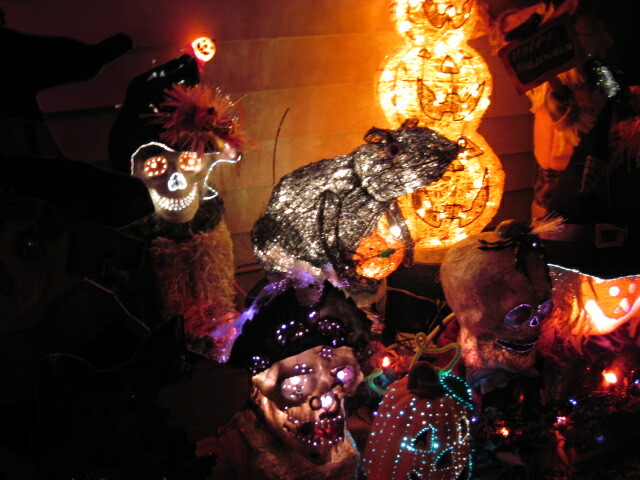 Sam and Jim Bateman have decorated their front lawn and porch with spooky ghoulish creatures, lights, pumpkin heads, spiders, and all things Halloween. 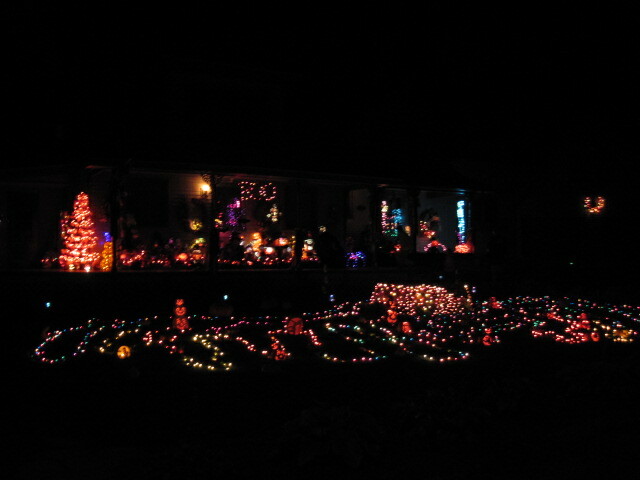 Their home, located on route 28N in Long Lake, creates an impact at night surprising passers by with the orange glow from the decorations. Sam has witnessed cars driving by at full speed stop in their tracks and back up to check out her display. When asked why she does it? Whether its Halloween, the Fourth of July or Christmas, Sam likes to have fun with whatever holiday she can. Check out her displays nightly at darkness until about 8:30pm. Their home is on Newcomb Road in Long Lake, about a mile from the intersection of Route 30 and 28N. 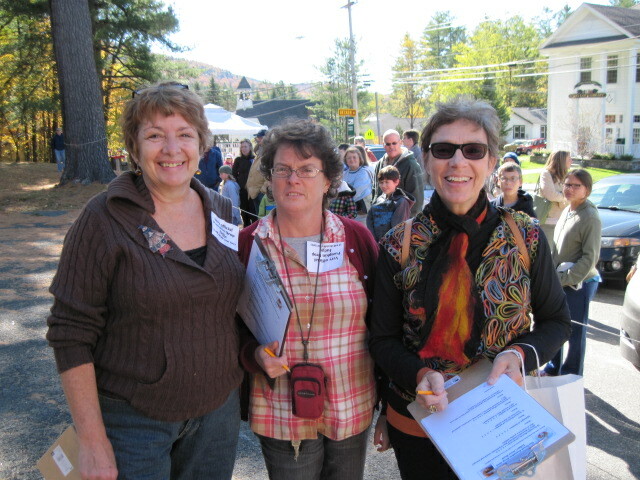 An Adirondack Affair on Oct 1,2 took fans of the soap opera genre behind the scenes. A panel discussion on Friday night tore apart the realities of the future of soaps and what could have prevented the downsizing of the industry. Panelists listed everything from the OJ Simpson trial as the first death knell to the internet and shrinking budgets and lack of corporate vision. Saturday workshops included writing. Participants learned about the process of how a daytime drama script is conceived and written in a short window of time and 250 episodes of material have to scribed a year. Acting workshops saw Yvonne Perry ex-Rosanna from As The World Turns work scenes with aspiring actresses. Martha Byrne worked on the 2nd workshop session and her students ran scenes with her from As The World Turns and All My Children. The classes were so small, each student really had an opportunity to work up close with our actresses. The finale workshop with Ellen Dolan was yet another special treat. Ellen performed scenes playing all the characters of Lucinda, Lisa and Nancy Hughes. Ellen’s impersonations and line readings showcased her depth as an actress as well as her sense of humor and love of the genre. “Acting is playing” says Dolan. Saturday night featured a VIP reception for special guests to meet everyone up close and personal and then a cabaret at the Town Hall in LL. Ellen Dolan opened up the show with a rendition of “What Will I Do” a goodbye to Scott Holmes, her TV husband for over 20 years. A strikingly emotional and beautiful vocal performance. It was a great weekend for fans and for people interested in television production and the arts. We look forward to hosting this event again next year. A do-not miss event. 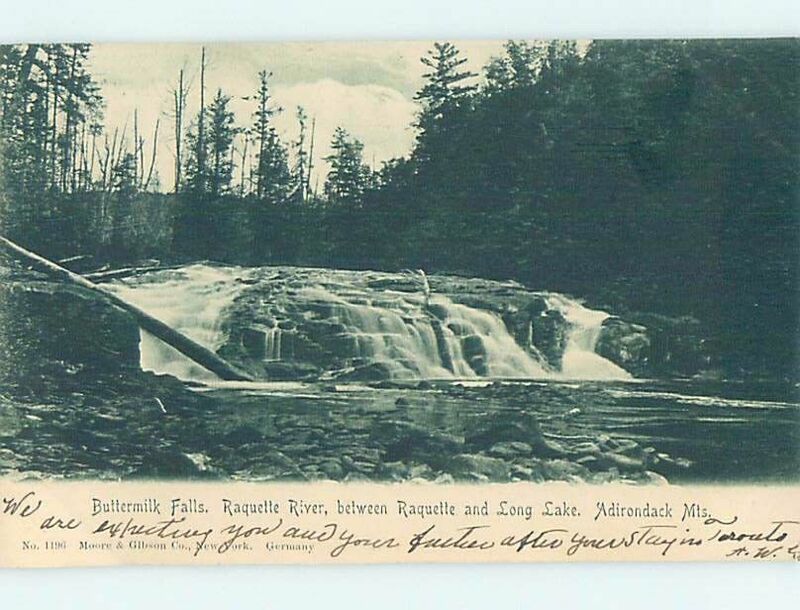 Now, as director of tourism in Long Lake (population 850 year-round, 6,000-8,000 summers), she has organized a two-day event this weekend called “An Adirondack Affair.” A panel discussion tonight will address the question: What happened to our shows? 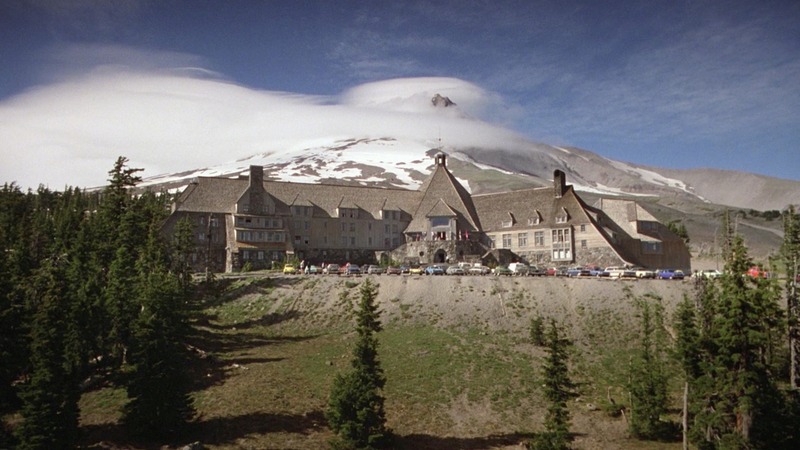 Much has changed since 1978, when Roalsvig began watching “As the World Turns.” Then, it was the most-watched daytime drama with 10 million viewers. Two weeks ago, it went off the air after 13,858 episodes. It debuted in 1956. With the demise last year of “Guiding Light,” only six daytime soap operas are left, down from a peak of 19 in 1970. You can blame O.J. Simpson for that. After Simpson’s murder trial in 1995 pre-empted daytime TV for months, ratings for soap operas never returned to their pre-trial numbers, says Fritz Brekeller, a director who has worked more than 20 years in soap operas, helped write histories of leading soaps and is conducting research for a documentary about soap operas. In addition, the Lifetime network was gaining in popularity by airing shows geared to 18-to-49-year-old women, the demographic that had bolstered soaps for decades. More and more women went to work. More cable channels sprang up — then soap-inspired prime-time dramas such as “Peyton Place” and “Dallas,” then the Internet, then reality shows. They all sucked viewers from the soaps. And as ratings declined, the soaps started downsizing, reducing casts, cutting salaries and compromising creativity. “It really is all about downsizing in corporate America,” says Byrne, the award-winning actress who spent more than two decades on “As the World Turns.” “It involves a lot of different aspects of how the world is changing.